from the Tweeddale press group. 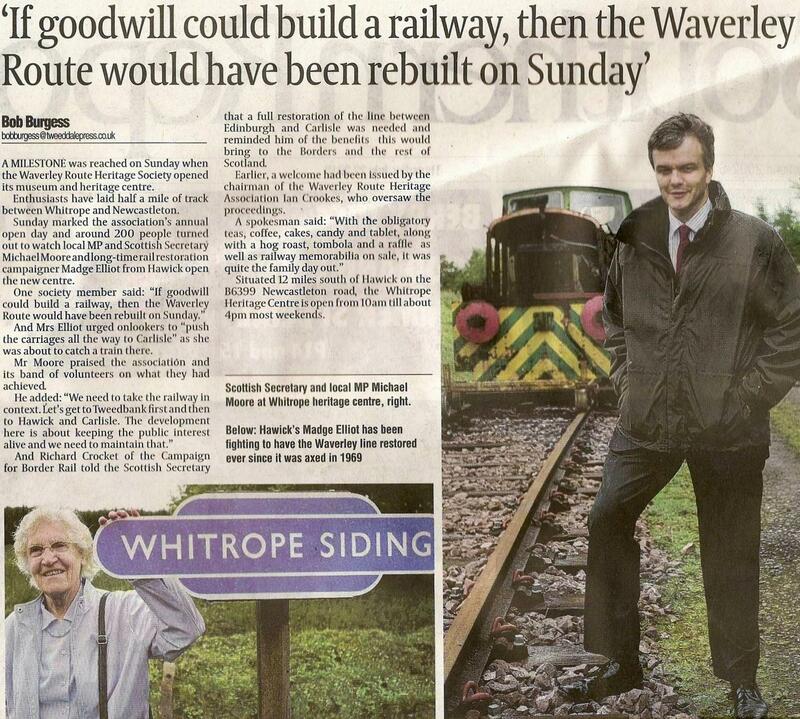 On behalf of your sister organisation looking to see the provisions of the 2006 Waverley Railway Act of the Scottish Parliament carried through, I should like on behalf of the Campaign for Border Rail to congratulate you warmly on all that you have achieved down here at Whitrope and to wish you every good wish for your continuing development. You are particularly to be commended in being the first along the line of the old railway actually to have permanent way on the ground. We look forward to the appearance of JCBs and operatives in high viz jackets along the valley of the Gala Water hopefully within the next 18 months. When that happens we can perhaps relax a little in the face of continued sniping in some parts of the media and the political establishment against the plans to restore rail links to the Borders. I am constantly amazed by the short-sightedness of the anti-rail brigade. In the shorter term, a recovering economy is going to see crude oil prices creeping up again – very probably reaching $150 a barrel as early as next year. The £10 a gallon pump price for petrol is nearer than you think. (Hands up those who are happy with that prospect. I thought so). In the longer term, at some point a future Scottish Government, irrespective of political allegiance, is going to have to address the fact that growing use of the railway network, both for the passenger and trainload freight markets, is going to be constricted by the fact of there effectively being only two double track crossings of the Border – that at Gretna and the other many miles away near Berwick. A glance at an Atlas will show that the latter in particular, is not best placed in terms of Scottish centres of population and industrial development.